I remember coming across the image below when I was at college, stuck up on the walls of the Religious Studies department. As you can see, it’s of Hitler making his usual, lazy salute with his hand flung casually back, into which a giant figure representing capitalist big business is giving him wads of notes. The image is obviously about how big business funded the Nazis. It’s not entirely accurate, as the Nazis were first ignored by the large corporations, and they were funded instead by small businesses and the lower middle class. But Hitler later appealed to them and once in power Nazi policy always favoured monopoly capitalism. But you could easily replace the photograph of Hitler with that Tweezer, Tony Blair or one of the Independents. Especially the Independents. As I’ve discussed many times, they’re all corporatists, who let their donors in big business decide their policies and send their staff to ‘assist’ them, and give their donors posts in government, in return for their funding. They are also, all of them, hostile to working people. They are anti-union, for privatisation and austerity, and against the welfare state. And that is why they, and the media, so viciously hate Jeremy Corbyn. Not only does he intend to turn back Thatcherism and actually empower people, he and Bernie Sanders in America are doing so by appealing to ordinary party members and their money rather than big business. So get corporate money out of politics, the Blairites, Independents and Tories out of government, and Jeremy Corbyn in. And may Bernie do the same to the corporate Democrats and Republicans in America! William McCarthy, The Future of Industrial Democracy (1988). 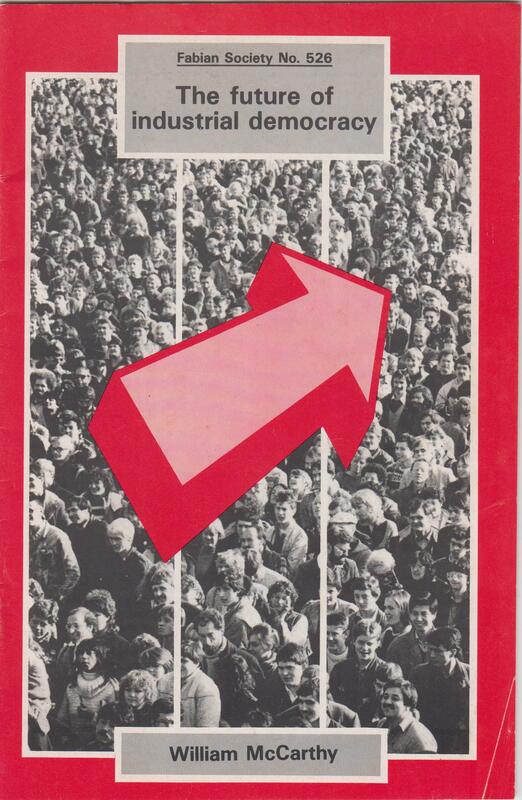 This pamphlet has concerned itself with the change required in Labour’s policies for extending the frontiers of industrial democracy. It has been suggested that the objectives in People at Work need to be given concrete expression in an enabling statute which provides for the creation of elective joint councils at establishment level in all private firms employing more than 500 workers. In the case of multi-establishment firms joint councils will be needed at both establishment and enterprise level. Similar arrangements should be introduced into the public sector. The primary condition for the establishment of joint councils would be an affirmative ballot of the workers concerned. Employers would be entitled to “trigger” such a ballot in association with recognised unions. In the absence of employer agreement recognised unions would be able to invoke the ballot procedure unilaterally. Where there were union members, but no recognition had been granted, a union with members would still be entitled to trigger a ballot covering the workers it wished to represent. Where no union members existed a given proportion of the labour force, say 10 per cent, would also be free to demand a ballot. In all cases there would need to be a majority of the workers affected voting in favour of a joint council under the terms of the enabling Act. Such a vote would be legally binding on the employers; and there would be suitable sanctions to secure enforcement. Worker representatives would emerge by means of a universal secret ballot. Recognised trade unions would be given certain prescribed rights of nomination. Where unions had members, but were denied recognition, appropriate unions would also have the right to make nominations. This need not prevent a given number of workers from enjoying analogous right to make nominations. Councils would have a similar right to be consulted on all decisions likely to have a significant impact on the labour force-using words similar to those set out in the EC draft Fifth Directive. This would be complemented by an obligation to consult the joint council on a number of specified subjects-such as manpower plans, changes in working practices, health and safety matters, etc. There would be a right to propose alternatives and a limited right of delay. Worker representatives would be under an obligation to present management proposals to their constituents for their consideration. The statute would stress that one of the main objects of consultation would be to raise efficiency and improve industrial performance. The workers’ side of a joint council would have a right to complain to a special court if any of their statutory rights were ignored or denied by an employer. This would be empowered to make orders against a defaulting firm as a final resort. The most radical changes in established Labour party policy that are recommended in this pamphlet concern the need to modify the principles of single channel representation, as these were expressed and applied to worker directors in the majority report of the Bullock Committee on Industrial Democracy. It is argued that if Labour is to establish a positive and convincing case for industrial democracy in present day Britain it must be prepared to urge its introduction over the widest possible area. To help retain the justifiability of single channel representation at board-room level Bullock understandably felt the need to confine his proposals to a fraction of the labour force. It is suggested that this degree of selectivity would not be acceptable today. There should also be a limited area of joint decision taking or co-determination covering such matters as works rules, health and safety policies, the administration of pension schemes and training. Joint councils should also be given rights to develop and monitor equal opportunities policies and administer various government subsidies. They could also be linked to a Labour government’s regional or industrial planning process. They should provide the final internal appeal stage in cases of unfair dismissal and discrimination. Labour should place much more emphasis on the positive case for industrial democracy. They should focus on the extent to which workers need to feel that they have some degree of influence over their work situation. Above all, Labour should stress the well-established links between participation and improvements in industrial efficiency and performance. They must emphasise that the development and extension of industrial democracy would produce substantial benefits for the community as a whole, quite apart from its impact on working people. By stressing these aspects of the argument, it would be possible to attack the credibility and naivety of Thatcherite assumption concerning the need to ‘liberate’ British managers from all forms of regulation and responsibility-irrespective of the effects on workers in their employ. It should also make it more difficult for Labour’s opponents to misrepresent the negative case for participation as a mere cover for union restriction and control. The pamphlet makes a strong case for the establishment of joint councils below boardroom level, which would extend workplace to democracy to a greater proportion of the work force than recommended by the Bullock report. It shows how arguments for control of the means of production by the workers themselves have been around ever since Gerard Winstanley and the Diggers in the 17th century. He also shows, as have other advocates for worker’s control, that such schemes give a greater sense of workplace satisfaction and actually raise productivity and efficiency, as well as giving workers’ greater rights and powers over the terms and conditions of employment. This is in very stark contrast to the current condition of the British economy, created through the Thatcherite dogmas of deregulation, privatisation and the destruction of unions and worker’s rights. British productivity is extremely poor. I think it’s possibly one of the lowest in Europe. Wages have been stagnant, creating mass poverty. This means that seven million now live in ‘food insecure’ households, hundreds of thousands are only keeping body and soul together through food banks, three million children subsist in poverty. And the system of benefit sanctions has killed 700 people. This is the state of Thatcherite capitalism: it isn’t working. As for the proposals themselves, they offer workers to become partners with industry, and contrary to Thatcherite scaremongering that ‘Labour wants to nationalise everything’, G.D.H. Cole, the great theorist of Guild Socialism recognised not only the need for a private sector, but he also said that Socialists should ally with small businessmen against the threat of the monopoly capitalists. Thatcher promoted her entirely spurious credentials as a woman of the working class by stressing her background as the daughter of a shopkeeper. It’s petty bourgeois, rather than working class. But nevertheless, it was effective propaganda, and a large part of the electorate bought it. But the Tories have never favoured Britain’s small businesses – the Arkwrights and Grenvilles that mind our corner shops. They have always sacrificed them to the demands of the big businessmen, who manipulate and exploit them. For the examples of the big supermarket chains exploiting the farmers, who supply them, see the relevant chapter in George Monbiot’s Corporate State. Coles’ support for industrial democracy was thus part of a recognition to preserve some private enterprise, and protect its most vulnerable members, while at the same time socialising the big monopolies and extending industrial democracy to the private sector, in order to create a truly democratic society. This is another point that needs stressing: without workers’ control, democracy in general is incomplete and under severe threat. The corporatism introduced by Thatcher and Ronald Reagan, and extended by subsequent neoliberal administrations, including those of Blair and Clinton, has severely undermined democracy in both America and Britain. In America, where politicians do the will of their political donors in big business, rather than their constituents, Harvard has downgraded the countries’ status from a democracy to partial oligarchy. Britain is more or less the same. 75 per cent or so of MPs are millionaires, often occupying seats on boards of multiple companies. Big business sponsors party political conferences and events, even to the point of loaning personnel. As a result, as Monbiot has pointed out, we live in a Corporate State, that acts according to the dictates of industry, not the needs of the British public. This needs to be stopped. The links between big business and political parties need to be heavily restricted, if not severed altogether. And ordinary workers given more power to participate in decision-making in their firms. In commerce and finance a similar process has come into operation. The wholesale traders are reducing the retail traders to the role of distributive agents working on commission. And the great manufacturers are gaining control both over the wholesale and retail trade. The great departmental store, the large importers, and the co-operative societies have been displacing great numbers of small shopkeepers. The tendency of modern times appears to be the displacement of the independent lower middle class by a salaried class of clerks, salesmen, official and civil servants. This process of concentration in commerce and finance could not escape the observation of a sociological writers like H.G. Wells. “Shopkeeping, like manufactures,” he declares, “began to concentrate in large establishments, and by wholesale distribution to replace individual buying and selling… The once flourishing shopkeeper lives to-day on the mere remnants of the trade that great distributing stores or the branches of great companies have left him. Tea companies, provision-dealing companies, tobacconist companies, make the position of the old-established private shop unstable and the chances of the new beginner hopeless. Railway and tramway takes the custom more and more effectually past the door of the small draper and outfitter to the well-stocked establishments at the centre of things; telephone and telegraph assist that shopping at the centre more and more… And this is equally true of the securities of that other section of the middle class, the section which lives upon invested money. There, too, the big eats the little. through the seas and shallows of investment flow great tides and depressions, on which the big fortunes ride to harbour while the little accumulations, capsized and swamped, quiver down to the bottom”. I think Wells was the son of a shopkeeper, and so had personal experience and interest in what was happening to this class. And the description of how trade was moving away from the local area into the centre of towns, assisted by the trams and railways, along with orders by telephone and telegraph, could almost be a description of the ruin of modern British high streets by the construction of vast, out of town shopping centres and the mass ordering of goods by shoppers through internet dealers, like Amazon. We’ve been here before, folks, and Old Labour had the capacity and will to solve those problems. And it still has, if it can get past the Blairites and their intransigent advocacy of big business against the worker, the employee and the small businesspeople.